In celebration of AWARE Week, a co-branded PADI® and Project AWARE® initiative aimed at empowering more divers to look after the underwater world, PADI dive operators and shops around the world will join together in a global movement for ocean protection by running conservation-minded events and activities from 15-23 September. Whether it’s becoming a debris activist, saying no to single-use plastics or making responsible seafood choices, no action is too small to protect and preserve our ocean planet. AWARE Week provides you with the tools and inspiration to encourage positive actions for the health of fragile underwater environments, fins on and fins off. Interested in planning an AWARE Week event in your area? Here are some ways to get ready and bring together your student divers, friends and family to act for change in your local community. Get ready to teach Project AWARE specialty courses: If you’re not a Dive Against Debris® or AWARE Shark Conservation Diver Specialty Instructor, apply for your rating today. One hundred percent (that’s right, 100%!) of your application fee is donated to Project AWARE. Not a PADI Open Water Scuba Instructor yet? No worries, PADI Divemasters can apply to teach the newly revised Project AWARE Specialty course after taking a Project AWARE Specialty Instructor Training course from a PADI Course Director. Download AWARE Week social banners to spread the word. Create a Facebook event and use the #AWAREWeek hashtag on Instagram and Twitter to encourage participation and join the online conversation. Make your dives count and help clean the ocean: If you want to make your dives count for ocean protection during AWARE Week, conduct Dive Against Debris surveys. Download your Dive Against Debris survey toolkit, which includes the must-have materials you need to successfully plan and conduct a survey dive including tips to choose your survey site. Display the AWARE Week video in your local shop and gather interest for the Project AWARE specialty courses: Dive Against Debris Specialty, AWARE Shark Conservation Diver Specialty, and the newly revised Project AWARE Specialty. Ask people visiting your dive shop to leave their contact details if they’re interested in taking part in AWARE Week. Closer to the date, send them an invitation to sign up for a Project AWARE specialty course during AWARE Week or to any other event you may organize, a club night, a fundraising challenge – you decide. Whatever you do during AWARE Week, make it fun and make it count for ocean conservation. If your students complete a course during AWARE Week, make sure they receive the PADI limited edition card supporting Project AWARE’s conservation work, and use this opportunity to celebrate the beauty and wonders of the ocean! From kids to seniors, non-divers to pros, we can all make a difference in our global community. Join the AWARE Week celebrations! For more info or to download the AWARE Week Toolkit for help hosting an event in your area, visit the newly launched AWARE Week website. Visiting PADI members together with Sheridan Hatcher from Marketing is always full on going from dive center to dive center. Our main goal during these visits is to improve our 5 Star members online/social media/web exposure and any other ways we can assist our members. In Vanuatu to some extent these members are still dealing with the aftermath of the cyclone that hit Port Villa almost one year ago. However, sometimes on these marketing/P5M trips we run into something that is unexpected. On our visit to Tranquillity Island, a PADI 5 Star Dive Center the dive shop managers, Toby and Erica asked us if we wanted to see the Turtle Sanctuary that is based on the island. Hawksbill Turtles are considered critically endangered, meaning the species faces a very high risk of total extinction. The first year of their lives is the most perilous, many get snatched by hungry predators before even tasting the ocean. Humans, however, are the greatest threat. Plastic waste chocking our oceans; unsustainable fishing methods; propeller-damage from speedboats, jet skis and other vessels are amongst the key killers of sea turtles. Not only are they considered the most endangered species of turtle, Hawksbills rank as the 4th most endangered species on the planet according to the WWF, behind the Amur Leopard, the Black Rhino, and the Cross-River Gorilla. What a great project run by a team that know their stuff too. Pretty much all of our PADI members contribute something to the environment and that is something to be very proud of. Over the past two decades of underwater conservation we’ve learned that divers are true leaders in ocean protection. We’re ocean heroes numbering in the millions across the globe. We believe together our actions will make a huge impact and will help to rescue the ocean. Weather you take fishing line out of the ocean during your dives, take some trash off the beach or volunteer at a turtle sanctuary as divers we care about our environment and protect our ocean planet – one dive at the time. As divers we have the unique opportunity to have a voice for marine creatures who don’t have one. Most of us do our part for marine conservation but not many are as committed as the Friends for Sharks crew. Shark enthusiasts Kathryn and Nicholas took a year off from their day to day routine and created Friends for Sharks which is a marine conservation cause working to support charities Project Aware and Shark Trust and increase worldwide awareness of the plight of sharks. Kathryn and Nicholas decided to spend one year on the road and have recently spent 6 months in New Zealand where they spoke to approximately 6500 people across 78 events. New Zealand PADI Regional Manager Jen Clent recently interviewed them about their trip so far. When did you decide to pack up and spend a year on the road? Friends for Sharks was born on August 28th 2014. Kathryn had just suffered a split disk earlier in the month and was confined to bed. Our work was seasonal and on a boat, so not only was Kathryn unable to work, but my work was also ending soon. Kathryn came up with the idea of us spending a year travelling to promote shark conservation as a way to employ our time productively as she recovered from her back injury. The aim of Friends for Sharks is two-fold. Firstly and most importantly in our mind, to educate people as to the importance and plights of sharks and to encourage a desire to help sharks by developing an emotional connection through story telling. Secondly we raise money throughout the Tour in support of two charities: The Shark Trust and Project AWARE. Where does your passion for sharks come from? K: I’ve loved sharks for as long as I can remember. I took a shark book in to school for show-and-tell at the age of four. It was a classic 80’s book: shark attacks, teeth, blood etc. It made the rest of the children cry for which I was made to stand in the corner! I’ve always stood up for the underdog and at that moment sharks really seemed to have few friends. N: Sharks have been a growing passion since I developed a love of the oceans at a young age. They’re an iconic group of creatures with fearsome reputations that from my experiences are entirely unfounded. As a diver, the more sharks I saw, the more I appreciated their grace and beauty. I don’t think there are many people who can spend much time with sharks and not develop a passion for them to some extent. Where have you spent your time on the road so far? We started around Cornwall in the UK at the start of 2015. The trip really got going after 6 days in London at the end of February when we then flew to Vancouver for a week. This was followed by two weeks in Rarotonga the first of which was spent doing events, then enjoying a week off to recover from the previous 6 months of planning and organising. The bulk of our tour has been spent in New Zealand – 3.5 months travelling around the South Island, then 2.5 months working our way up from Wellington to Auckland. Where to after New Zealand? We are currently in Melbourne, Australia, for 2 weeks where we have a couple of events, but are also enjoying a break with family. The next portion of our tour takes us to Fiji, Cambodia and Thailand. We have teemed up with a group called Projects Abroad who have invited us to spend time with them to share our knowledge and skills with their marine projects and local communities in those three countries. This will take us up to just before Christmas and the end of our Tour. What has been the thing that surprised you most on your trip so far? We have talked to all ages from kindergarten through to retirement homes and what we’ve found fascinating is that the youngest children have the greatest love and fascination with sharks. There is almost no fear at all. From around the age of 6 onwards, more people mention being scared of sharks despite the fact that next to none of those people have seen sharks in the wild. While we did expect that to be the case to an extent, we were surprised by just how little fear was expressed by the youngest children and it is clear that as children grow up, the media they encounter – and no doubt warnings from parents and others – has a huge impact on how they view sharks. We are in essence bringing up another ‘Jaws generation’. How many people have you delivered your message to? While we’ve had to guesstimate numbers at our larger events, our current figure stands at approximately 6500 people across 78 events. We have also raised close to £8000 so far! What do you believe are the top 3 misconceptions people have about sharks? I think the most common ‘I had no idea sharks…’ comment we’ve received from our talks has been about how calm and characterful they are. Close in line would be beliefs around shark attacks and how they’re out to get us when really all they do is ignore us or occasionally come close to see what we are. Finally, a common misconception is linking old to stupid. Sharks have been around for hundreds of millions of years and many people equate old to primitive, and that to stupidity. They tend to believe that sharks are essentially tubes with teeth, governed by their sense of smell and will eat anything they can get hold of. The reality is that they have considerable intelligence and often surprise with their adaptability. What advice would you give to the Dive professionals to assist in changing the publics opinion of sharks? Share stories. We’ve found that the best way to engage people’s interest is by describing our encounters with sharks. Not only does this educate and correct the misconceptions listed above, but it’s the stories that people will remember. I would also hope that any business fortunate enough to operate where sharks are common, uses them as a draw not for ‘high adrenaline, scary shark encounters’, but promotes the grace, calm and beauty of these animals and takes the chance to educate their clients as to the true nature of sharks. It’s these people sharing their experiences with their friends who will spread the message still further. No. The experience has been incredible but also very tough. If we were taken back to where we were just over a year ago knowing how we feel about it, we would definitely do it all again due to the huge amounts we’ve learned both about ourselves and new skills, but we won’t be doing a second World Tour. Once the tour is complete Friends for Sharks will likely go in to hibernation for a short while. We’re moving from the UK to New Zealand and have to find jobs and set up new lives. Once we’re settled though we aim to continue the shark work with schools and similar in our local area. We’d also like to develop some trips combining shark diving with evening lectures so if you might be interested in joining us for those in the future, join our newsletter and social media to keep up to date! If you would like to donate to their cause or get involved in any conservation events there are always many things we as divers can do, simply check out Project Aware or contact your Regional Manager or local Dive Centre to find out how. Finathon Team has their very own Great White Shark named in their honour! Down in the South Island of New Zealand are a group of enthusiastic PADI Dive Instructors with a huge passion for sharks. Every year they get on board and promote awareness and raise money for their protection and conservation as part of Dive Otago Ltd’s annual Project Aware Finathon. Their Finathon team name is Team Tomahawk. Having recently spent a day diving with majestic Great White Sharks, the team were even more in awe of these creatures and began a campaign in the build up to their Finathon to spread the love of these animals to anyone who would listen. Using their creative side the team made a series of hilarious short videos to enlighten folk as well as educating people about shark statistics and facts. They also spoke with various groups to educate them on the plight of sharks both in New Zealand and globally. “Team Tomahawk is no stranger to Project AWARE’s Finathon, & has been participating since the ideas inception in 2013. This was the third event for myself and the lads, & we completed our challenges after raising over $800 U.S dollars at the end of a legendary fun filled campaign to help the sharks of the world. As promised we completed a one minute breath hold for every $10 raised and clocked up some personal best breath hold times in the event as follows . Chris 3:33 . Bernie 3:12 . Levi 3:08 . We’ve achieved so much this year in terms of raising awareness for the plight of sharks in our small town of Dunedin, New Zealand … a town that still has a sense of anxiety regarding sharks given its large surfer population & even an ancient shark warning bell at one of our more popular beaches that was installed in the 1970’s after a series of shark sightings, when shark hysteria had peaked in the post “Jaws” years. Our videos have given countless people a good laugh but with a solid environmental message (even though some lurk the fringe of sanity and sensibility), we have also shown sensible conversational movies such as Rob Stewarts “Sharkwater” to all our friends and family. Team Tomahawk has been in the local paper, been interviewed on the local TV channels, made scientist and tv documentarian Riley Elliot laugh at our ridiculous “AWAREness” videos and also got some great news from the shark gurus (Warrick Lyon and Malcolm Francis) from NIWA (National Institute of Water and Atmosphere) about NZ shark statistics based on their studies, which turned out to not be the fire and brimstone reports the rest of the world’s shark populations are facing. I would say our a crowning achievement was not the video where a lonely shark ends up dating a gorilla, but an even more special outcome for our efforts. We provided a lot of raw images and videos of Great White Sharks from the deep south of New Zealand to NIWA in the hope to help them with their research, and only asked one thing in return… If there was an unidentified shark within the footage, could it be called “Tomahawk” in recognition of the work we were trying to do in raising awareness for these amazing creatures. NIWA passed the footage and my request on to lead White Shark expert Clinton Duffy from the Department of Conservation who is in charge of cataloguing these amazing Apex predators. As fate would have it, Clinton contacted me mere hours before the Finathon to confirm that we had witnessed 10 individual Great Whites the day we spent with them. He also informed me that there was one mature male, an estimated 3.7m long who was unidentified, and had been given the alphanumeric code STWI-1435 … and was now officially named “Tomahawk”. Epic! I would like to take this opportunity to say thanks Chris Zinsli, Bernard Lloyd and Levi Healey for their hard work and dedication to educating the public about why we should protect sharks and look forward to the next ‘silly’ idea from the team in the far south. Well done Team Tomahawk and Dive Otago! Members in New Zealand this month have a few activities that are capturing the fun and diversity of activities you can offer to keep your divers diving. You can view more information and photos on the Project AWARE website. Dive Otago are completing their annual Dive for Debris day this weekend in Sunny Dunedin and are offering the new Project AWARE Dive for Debris specialty as part of the event. With both beach and underwater cleanups happening it’s great to see divers and non divers of all ages participating in the event which will clean up areas on the peninsula home to penguins and sea lions. Learn more on the Dive Otago Facebook Page. 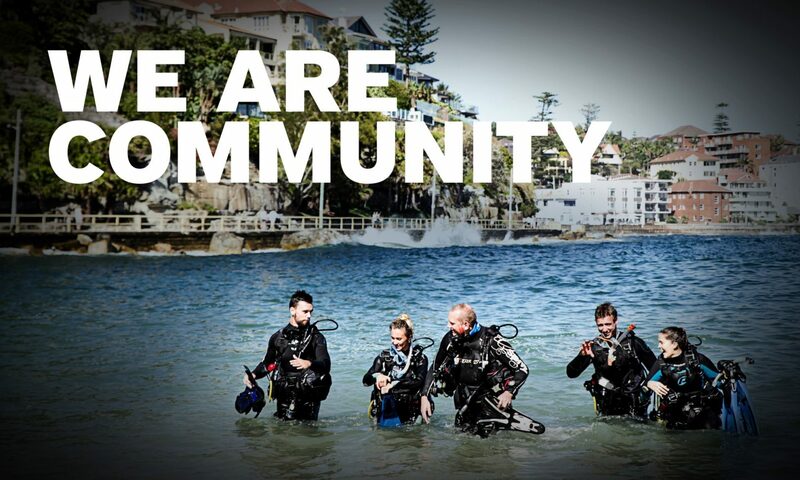 Dive HQ Wellington – The 24 Hour Dive Challenge has run for 2 years now and in that time have raised over $6500 for the Wellington Volunteer Coastguard, as well as highlighting their need for support as a volunteer organisation. The goal of the 24 Hour Dive is to have teams of divers underwater from 3pm on Saturday to 3pm on Sunday afternoon. Divers sign up for one or more 45 minute dives throughout the event and collect sponsorship for each dive. Refresher and training dives for certified divers and introductory dives and snorkel tours for non-divers will also be on offer to encourage participation. Last year they had over 50 divers participating and logged over 50 dives during the event including a staggering 9 hour dive by Pete and 9 dives logged by a single buddy team. There are spot prizes for divers, raffles and prizes for those who raise the most money from their sponsors. This year a beach dig for the children on Sunday alongside Coastguard’s sausage sizzle are on offer and more challenges for our divers to keep them entertained underwater! For further information check out the Dive HQ website. Dive Zone Whitianga are delighted to be hosting the eleventh annual Dive Festival this weekend on the beautiful Coromandel Peninsula. It’s a great weekend of gathering divers together from far and wide, entering into fun competitions with awesome prizes and a bit of social fun as well. This year’s guest speaker on Friday night is Shark Man Riley Elliot. With underwater photography competitions, treasure hunts, Scuba Olympics, spearfishing and cray hunting competitions there really is something for everyone during this action packed dive festival! Check out the Dive Festival website for further information. So as you can see with a little imagination you can encourage divers into the water – all the above activities are great for meeting new dive buddies, experience in a new environment and of course having lots of FUN! Be The Next Finathon® Champ! Join divers worldwide who are FINatical about sharks. Visit www.finathon.org to find out how you can bring your local community together to raise awareness for sharks or donate to one of our FINtastic teams. The clock’s ticking for vanishing shark species. You can join the race to protect them. If you’re FINatical about sharks, fundraise today. Like a swimathon – the Finathon is a great way to bring the community together, raise awareness and funds to support this unique cause. After great success and support during Master Divers 23km relay Finathon around Koh Tao in 2013, this year they’ve upped the ante and Gene Girardeau will complete a 43km open water solo swim! Gene is training every day and all donations will boost her motivation and help protect sharks. Whether it’s a 1km pool challenge, an island relay or a pool party the Finathon is fun for all and a great way to raise much needed funds. Will you get swimming to end finning in 2014? We’re looking for 100 Finathon Champions visit www.finathon.org to get started.